Louis Jobst' V lamp is composed from, a cone, a sphere and a triangle. Their proportions are carefully judged to create a harmonious formation, with each shape delicately balanced upon one another. The solid glass ball appears to be balancing as it weighs down on top of the ‘V’ cut base, reminiscent of architectural forms such as archways and columns. The blackened hardwood, clear glass and bead blasted brass enrich the composition with calm, natural tones and finishes. The brass shade directs an ambient light upon the reflective surface of the glass ball, contrasted against the matte black base. ‘V’ lamp is perfect for enhancing any contemporary space, creating a sophisticated focal point for side tables and providing an atmospheric light with a distinctive and original design. Contemporary solid glass lamp. Shade is not included. 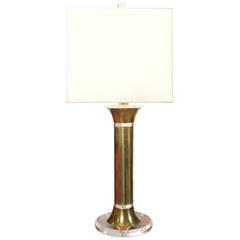 A contemporary column shaped lamp resting on a Lucite base with original makers label and a new linen shade.